WELCOME FRIENDS OF GREATER PORT JEFFERSON INC. 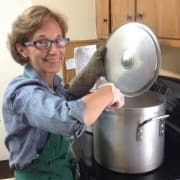 WELCOME FRIENDS OF GREATER PORT JEFFERSON INC.
For almost 30 years, Welcome Friends Soup Kitchen has been making our community aware of our neighbors’ needs. Our 200+ volunteers form an outstanding team that addresses hunger in the Greater Port Jefferson area and works to expand relationships with individual supporters, local food markets, farm stands, religious institutions, community leaders and local government. Welcome Friends strives to ensure that our guests need not fear the loss of meals. We create a sense of community for neighbors affected by hunger and poverty by serving them with dignity and respect in a safe, hospitable environment. Welcome Friends has provided hot, nutritious meals five days a week in the Greater Port Jefferson community. We typically serve between 50 to 70 guests each night. We are a 100% volunteer staffed organization, so every donation goes directly to serving our neighbors in need. WELCOME FRIENDS OF GREATER PORT JEFFERSON INC. accepts donations. Donate Now. Would you recommend WELCOME FRIENDS OF GREATER PORT JEFFERSON INC.?